There is more here than strictly needed for production use – just ignore most of this for now. The main bits are “jeemon” and the “kit/” sub-folder with all the JeeRev code in it. On Linux, the commands will be almost the same, but you’ll need to get a different JeeMon zip file. remote: Counting objects: 1810, done. remote: Compressing objects: 100% (670/670), done. Receiving objects: 100% (1810/1810), 1.45 MiB | 87 KiB/s, done. Resolving deltas: 100% (1187/1187), done. Then unzip using your favorite zip manager, and you should be good to go (I’ll optimize further, one day). Note: on Mac OSX and Linux, if “.” is not in your path, you’ll need to add it or type “./jeemon” i.s.o. “jeemon” everywhere it is mentioned below. If you got this far, then everything is working as intended. If not: you’ve hit a bug – please get in touch. No application startup code found. 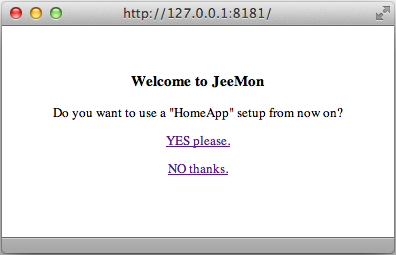 From now on, JeeMon will start up using the built-in “HomeApp” rig when there are no command-line args. The next steps depend on what you’re after – you can either dive into Tcl programming and explore how JeeRev (i.e. the kit/ area) is structured, or you can try out some examples and get a more top-down impression of it all. If you want to use a convenient interactive shell with scrollback, history, and debugging support, download the TkCon script and launch it using “jeemon tkcon.tcl” – this uses Tk to create a mini IDE. For Tcl manuals, books, and demos, see http://www.tcl.tk/. To really dive in, check out this tutorial or this. But chances are that you just want to get an idea of what JeeMon does in the context of Physical Computing, House Monitoring, or Home Automation. I’ll describe just two simple examples here, and will point to the JeeMon homepage for the rest. Note that everything described below is really part of JeeRev, i.e. the standard library used by JeeMon – or to put it differently, by the source files located inside the “kit/” folder. JeeMon is now running in async event mode, and keeps running until you force it to stop (with ^C, kill, whatever). Leave it running and go to the indicated URL in your browser. You’ll be greeted with a web page generated by JeeMon. Hit refresh to convince yourself that it really works. Now might be a good time to look at the code in examples/hello-rf12/main.tcl – to see how it all works. Wanna experiment? Easy: quit JeeMon, create a new directory “blah“, and copy the files from the example to it. Edit them as you like, then start JeeMon using “jeemon blah“. Go ahead, try it! – the worst that can happen is that you get error messages. Usually, error tracebacks will refer to JeeRev files in the “kit/” folder. This concludes my intro for those who want to get their feet wet with JeeMon. We’ve only scratched the surface! Feel free to ask and post anything else on the forum. If it gets out of hand, I’ll set up a separate area for JeeMon. you will need to change the path in the second line to point to the correct git.exe location on your machine. Thanks. I’ve changed the post to make it the default, with a note about “.” being in the path on Mac OSX and Linux. ooops, I have a confession… I just tried the same on Win7 x64… wget wasn’t recognised. Which puzzled me, so I went investigating how it worked on my XP machine. It’s in cygwin which I have installed… Whilst this is not at all a bad thing, it’s not something which many will have, which means the wget command won’t work. Yee, weird huh, no wget for Windows 7 x64! You don’t need wget. Use your browser to select the correct Jeemon for your OS/processor from https://jeelabs.org/pub/jeemon/ and it should download the file for you. I know, I was just trying to find a comparable step by step guide for windows. It’s odd really, the windows user has to use the GUI, whereas the Mac users use the command line! You end up having to use the GUI in windows to open the zip anyway as there is no built in zip handling from the command line. Even winrar’s command line can’t handle zips, only rars, whereas the winrar GUI can do pretty much everything. Weird eh! GUI should be fine, since that’s where you are already when reading this post. So a link which downloads and then double-click to unzip would be fine. The trick is to fetch the git area first, so that the instructions can say “move the exe you got into that jeerev checkout you did”. At this stage, JeeMon is only for developers, so it’s important to use git (IMO) – command-line or otherwise (isn’t there a tortoise-git or something?). It’d be relatively easy for me to create a zip snapshot with everything in it, and say “unzip and double-click jeemon.exe”. But the goal here is not just to get everything right, but to also get the process in place which supports development, updates, check-ins, patches, diffs, etc. Or in short: this isn’t about getting a fish (once), but about learning to fish (forever). PS. If a separate page with screenshots etc is needed, fine. Plenty of free bits available on the wiki. Thanks for the interesting, useful, complex yet nice series of JeeMon. It clarifies various bits involved in the setup nicely. About fishing… very grateful, nice to be re-learning to fish again here! This all involves so many different methods, hw/sw/languages that, for someone like me, it’s a totally new adventure. I hope you/we get to share the developments related in the wiki or future blog posts.